The American Green Tree Frog, also known in the scientific world as hyla cinerea, makes a wonderful pet. These frogs are well-known for their sticky bodies, which allow them to climb and cling to glass, leaves and habitat decorations. Considering the care that goes into keeping a green tree frog, it’s recommended that only older children, teens and adults consider this incredible creature as a pet, since this ensures that the animal is getting the proper care. What is a Green Tree Frog? The green tree frog can be most commonly found in central and southeastern America, and most are found from Virginia all the way to southeast Florida. Certain species can also be found as far to the west as Texas and as far north as New York. They can often be found in the wild clinging to trees, branches and in residential pools croaking throughout the night. Green tree frogs are relatively sedentary creatures that like to be kept alone. For this reason, there is no need to keep multiple frogs in one tank to keep each other company. Green tree frogs tend to not like being held, so consider these pets more for observation rather than for handling. Certain frog species are dangerous to one another, causing a rift in hierarchy when put into the same cage or tank together. Be sure to only keep one species of frog together if you wish to have multiple frogs. Green tree frogs are incredibly gentle and timid creatures. They love nothing more than a warm, well-misted tank and plenty of vegetation and food. They are not necessarily keen on being touched and handled regularly, and if you must pick up the frog, be sure to wear gloves at all times as the oils on your hands can disturb the natural pH balance on the frog’s skin. Frogs generally sleep during the day and are up throughout the night. The green tree frog has a very loud vocal range, so keeping one in a bedroom may prove to be more bothersome than it is worth. 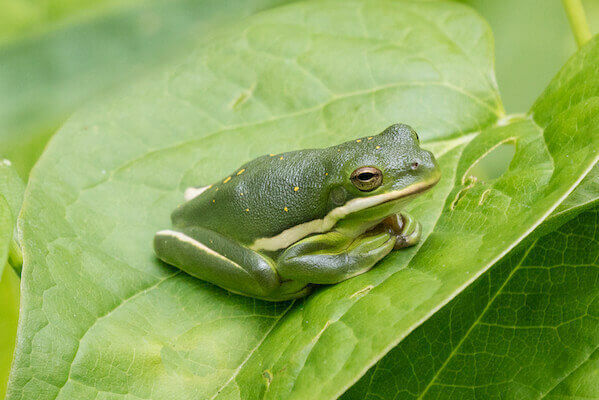 Expect the green tree frog to croak throughout the night, which is their way of communicating with other frogs. Before setting up a tank for your new green tree frog, it is important to temporarily quarantine your new frog if it’s going to be introduced into an already-established tank. Experts recommend keeping frogs separated for at least three months to ensure that the new frog is healthy enough to go with other frogs. The lengthy quarantine is due to the fact that many reptilian-related illnesses and parasites don’t always show up right away, and despite the fact that your frog looks healthy doesn’t necessarily mean that it is. Because your frog is native to a semi-tropical area, it needs a tropical setup. Glass aquariums are best because they act like mini greenhouses, which is ideal for keeping the habitat warm and humid. An aquarium with no less than a 10 gallon capacity is needed for each individual frog. If you wish to keep multiple frogs, have one frog per 10 gallon tank to ensure adequate room. A screened lid on top of the tank allows for proper ventilation and prevents mold growth inside. Tree frogs prefer to have vertical mobility rather than horizontal, so a tall tank rather than long one is preferred. You can use an under-tank heating system placed on one end of the tank to properly warm the environment for your tree frog. Most frog owners prefer a nocturnal heat lamp that goes over the cage as opposed to under it. These heaters use a 15-watt lamp to adequately warm the tank as well as to add enough light for your frog when it is awake. Never put a heat source near a wooden enclosure, as it can burn the wood and cause a fire hazard in your home. Always put your heating source between the tank and screen so that your frog cannot climb onto the bulb directly and burn itself. Artificial substrates are often preferred for your frog’s tank because they are not easily ingested by the animal. 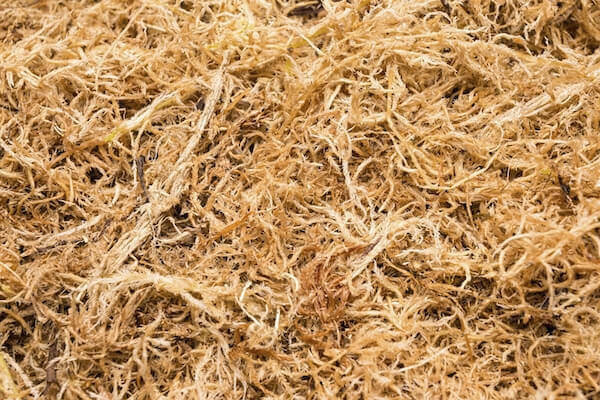 Faux grass is an ideal substrate as it is soft for your frog’s feet, but is not pleasant for them to eat. Reptile carpeting is another ideal option, as it is specifically made for frogs and other reptiles. You can find reptile carpeting online or in any pet store that sells reptile products.Decorations are a great option for your new tree frog, since it provides a place for them to hide and climb. Tree frogs love vegetation, so consider adding some real or fake plants into the tank. Air plants are the ideal go-to for many reptile enthusiasts as they are easy to care for and last a long time. Keep in mind that artificial plants are easier to care for and keep clean. You can also add natural decorations to the tank, like wooden sticks, logs and burrows. These allow your frog to climb and hide as they see fit. Tree frogs need a steady supply of food and water. A simple water dish placed inside the tank is adequate enough for your tree frog. Your frog will want to eat a steady supply of bugs and insects each day, and you’ll find that your pet eats more in the spring and summertime months than the wintertime. The size of your tree frog has an impact on how much they will eat. For example, an adult tree frog will eat more than an adolescent. If you notice that you put bugs inside the enclosure and they do not all get eaten within a matter of one or two hours, you’ve probably put in too much. Tree frogs’ main diet consists of insects such as crickets, meal worms, silk worms, moths and pill bugs. If you are at all squeamish about feeding live prey to a pet, the green tree frog probably isn’t the right animal for you. Because of the fact that frogs like to attack their prey and eat the insects while they are alive, you should never feed them dead or dehydrated bugs. 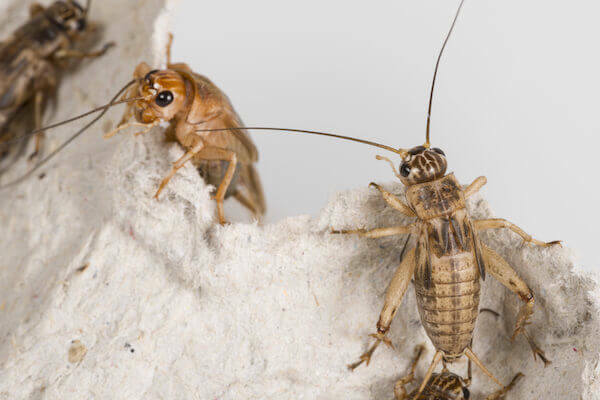 You can purchase live bugs from a pet store, and you should avoid picking bugs in your backyard to feed your frog as you do not know where the bugs have been. Your tree frog should never eat ladybugs, stink bugs and millipedes, as these can be harmful to their digestive system. In order to supplement your frog’s diet, you should purchase a calcium powder with added D3 and sprinkle this mixture over live prey. Your frog will ingest the supplement each time they eat a bug in its tank. It is recommended that you dust your frog’s prey every two to four feedings, with more dustings needed for adolescent frogs. There are also multivitamin drops you can put into the frog’s water that you can find in many pet stores and online. Once a month, you should remove all decorations, substrate and foliage from the tank and give it a thorough cleaning. Be wary of using cleaning products and soaps, as these can be dangerous and even deadly to your frog. Keep in mind that your frog will stick to the side of the tank, so any residue left behind will easily cling to their delicate skin. Hot water and a scrub brush do the trick when it comes to removing dirt, debris and slime.Each day, regularly inspect the tank for any dirt, debris or feces and clean it as needed. Be sure to get rid of any dead insects that are not being eaten, and be sure to change the frog’s water daily or when it gets dirty. Your frog will also enjoy a daily misting, as this helps to keep the tank humid and in a tropical-like state. Only use clear and clean water when misting your frog’s tank, and do not add anything to the water. 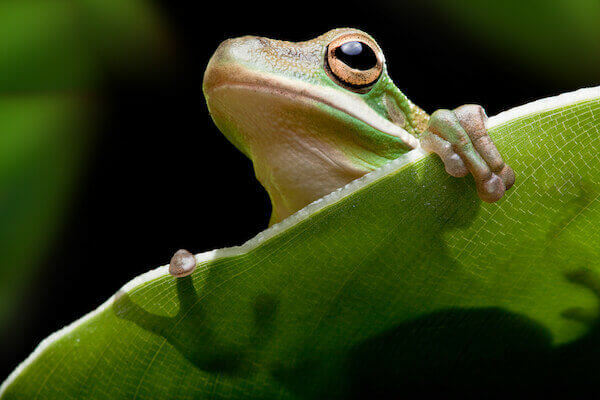 Tree frogs are pretty self-sufficient when it comes to their health. As long as you quarantine new frogs before introducing them into a habitat with your other frogs, you should have no issues with their health. However, if anything becomes a concern for you or if you notice your frog acting differently, it might be a good idea to get them checked by a veterinarian who specializes in reptiles. As long as you keep the tank in a tropical-like state, mist regularly and provide fresh prey and water, your frog will do quite well. There are many reptile enthusiasts who are more than willing to handle their frog’s health on their own. In general, it advised that you get a professional’s opinion before you take your frog’s health into your own two hands. Lack of appetite, for example, may be as simple as a lack of interest in the food you’re providing to them. Some frogs like specific bugs and food, so you’ll need to find what works for them. This is why it is always a good idea to become used to one frog and their habits and interests before getting another.Owning a green tree frog is a great way to observe the natural beauty of amphibians and their daily cycles. While this pet may not necessarily be for everyone, they make for a wonderful starter reptile for individuals who love frogs and would enjoy having one as a pet. Because they can be purchased from your local pet store relatively easily, you can begin setting up a habitat and begin your journey of owning a frog right away.